Sometimes, you have time to put together a whole new outfit. But sometimes you don’t. If your outfit isn’t “evening” enough, a quick fix is to swap out a light colour with a dark one. For example, if you wore a blouse with light wash jeans, you can swap the jeans for a darker wash (or fabulous leather pants). I go for a dress whenever I’m in doubt. Sometimes, I get frazzled thinking about what matches, what’s clean, and where everything is. It’s simpler to throw on a dress. Step 2: Don’t underestimate accessories! Jewelry can really add to the wow factor of an outfit! It’s useful to always have a few statement pieces ready. I have a jewelry rack (which I rarely touch…regrettably) next to my mirror. Whenever an outfit looks dull, I can quickly choose some bling to level it up. Smaller, more elegant jewelry can make an outfit look more put together in a subtle way. This is good for understated looks. Already wearing makeup? 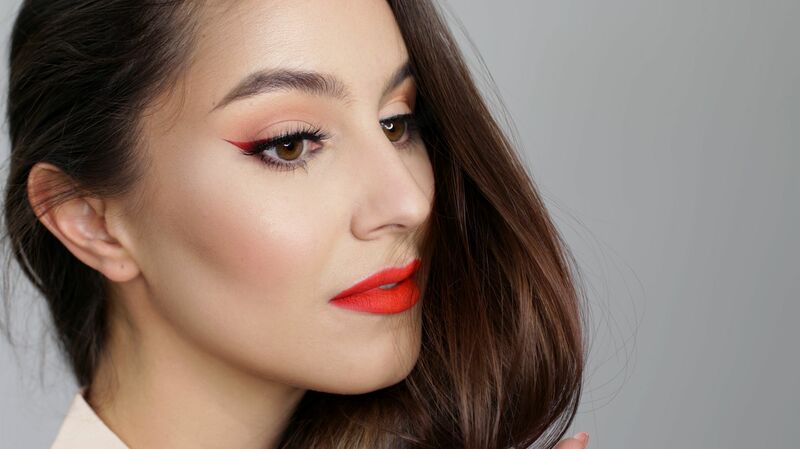 Now add a winged liner and red lip and you’re ready for the night! You can never go wrong with black liner, but a coloured liner is a simple and fun accent. Not wearing makeup? Have no fear! My fool proof 5 minute makeup routine goes like this: frantically apply a tinted moisturizer, lightly define the brows with a pencil, use a finger to pat on a shimmery eyeshadow, put on mascara, and lightly dust the cheeks with blush. Scent really impacts our mood and how we present ourselves. Plus, it’s a nice touch if you’ll be in close quarters with people. I never understood the significance of scent until I started working in salon/store and memorized the scent of every single product. My favorite going-out fragrance is Elizabeth Arden’s Red Door. It’s very warm and a nice blend of floral and musk. This particular fragrance also holds a special place in my heart! Heels can do so much for your outfit and your figure! They lengthen your legs, straighten your back, and add a extra bounce in your step. If you’re going to be walking outside in the winter time, it’s better to go for a chunkier heel, wedge heel, or ankle boot. However, if it’s been a long day and my feet are extremely tired, I’d wear sneakers and convince myself that nobody really pays attention to shoes anyways! Now that you’ve gotten ready in 15 minutes, run out the door and don’t be late for your plans!